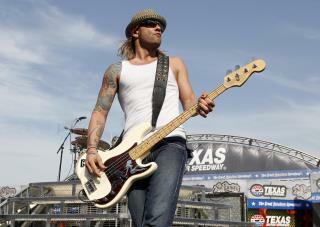 (Newser) – The founding member and former bassist of the rock band 3 Doors Down has been sentenced to 10 years in Mississippi state prison for possession of a firearm by a felon. Jackson County Circuit Court Judge Robert Krebs gave Todd Harrell the maximum penalty during a hearing Thursday. Authorities responded to Harrell's home after an alarm went off in June. Harrell's wife told deputies they had got into an argument that turned physical. While deputies were talking to the couple, they noticed guns and drugs in the home, reports the AP. Harrell had served two years in prison for causing a fatal crash in Nashville in 2013. He testified in 2015 that he had been addicted to prescription drugs and was speeding. The band, which has had hits including "Kryptonite," suspended Harrell after a second-offense DUI in 2012.
he would have gotten less time if he used it.